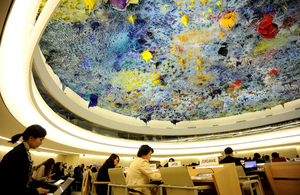 This UK statement was delivered during the Interactive Dialogue with the Working Group on Transnational Corporations and Human Rights and the Special Rapporteur on Migrants at the 35th session of the Human Rights Council on 9 June 2017. The United Kingdom would like to thank the Special Rapporteur on the human rights of migrants for his annual report. The UK notes the connection the Rapporteur’s report makes with the 2030 SDG Agenda and the process towards the development and adoption of the Global Compact on Safe, Orderly and Regular Migration. The UK stands firmly behind the New York Declaration on Refugees and Migrants and remains committed to the protection and promotion of the human rights of migrants. We must ensure that all migrants, regardless of their status, are treated with dignity and that their human rights are fully respected. We also believe we should all work together to ensure that in the future migration is a choice and not a necessity. Discussion about the human rights of migrants has to include a focus on destination countries. But we must also recognise that human rights violations and abuses in countries of origin are often among the root causes of irregular migration, and among the greatest dangers that migrants face in countries of transit. Unless we recognise and address these realities we will have failed in our duty to vulnerable people. The Special Rapporteur’s report pays attention to ‘push and pull’ factors for migration and mobility and highlights ‘poverty, violence, discrimination and poor governance’ as the main push factors for migration. However, we would like to see more focus on these push factors. We would like to ask the Special Rapporteur how he believes we can achieve more sustained dialogue and action on these issues, including as part of the consultations on the Migration Compact.